Got 20 minutes and/or 200 dollars? Walk away with something unique at the Alexis Bittar Sample Sale. 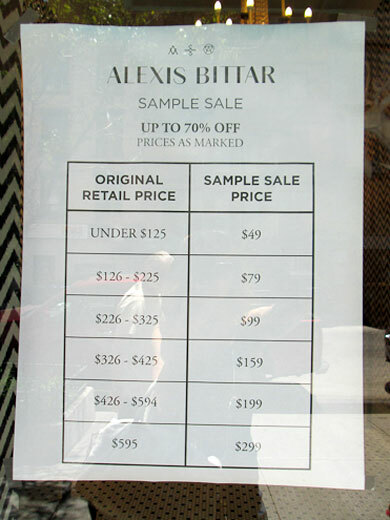 Alexis Bittar held his sample sale in Chelsea on 19th street, and it kicked off with a bang! With plenty of staff on hand to help corral the crowd, when we stopped by it was not a madhouse but was quite lively. No line to get in at that time, not too much drama in the rows, but a plenty long checkout line and plenty of ladies with their bounty: plastic bins overflowing with jewelry. Alexis Bittar is a very well renowned artist, creating custom jewelry collaborations for the likes of Thierry Mugler, Phillip Lim, and Jeffrey Scott. 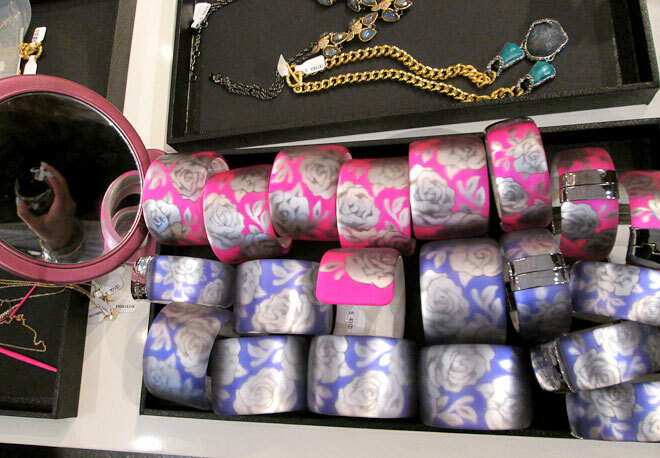 The designs are unique and trendsetting, and we see this stuff knocked off left and right, but if you aren’t fond of rashes or tarnished skin from cheap costume jewelry, this is where you can move on up. We saw pieces ranging from $49 to $200, and they also ranged in style from lacquer and lucite pop styles to glamourous and detail-drenched statement pieces. You could find something in this well organized sale for every doll you know. The walls were lined with shelves containing most of the pricier pieces and helpful staff restocking them constantly. 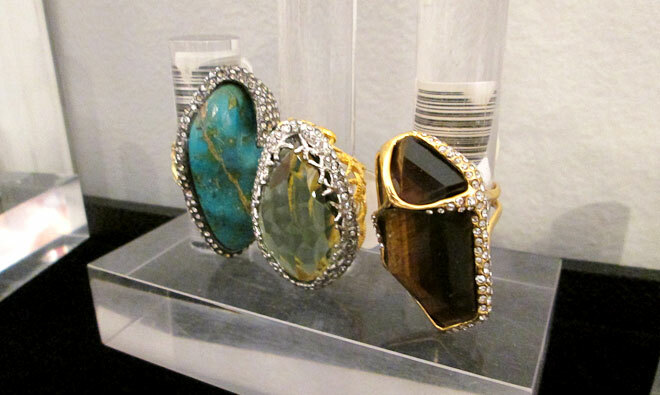 Here we saw turquoise, labradorite, and other semi precious gemstones. Things were gold dipped, neon paint dipped, and full of tiny side stones. 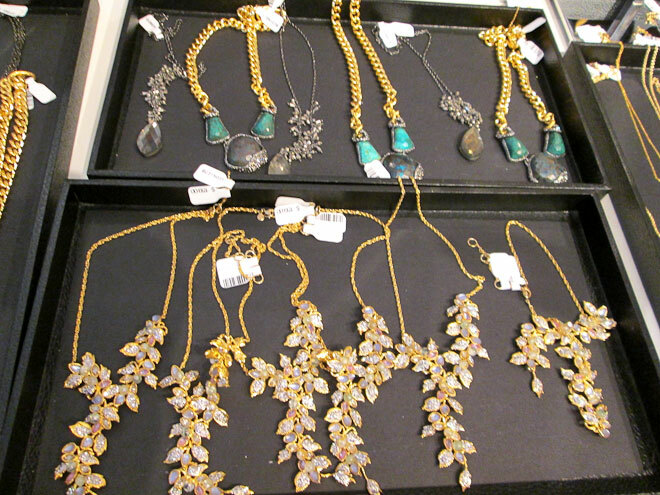 Necklaces really stood out, and there was a huge number of color selections. Stones or no stones, draped or fitted, futuristic or classic, we saw nearly every type here. 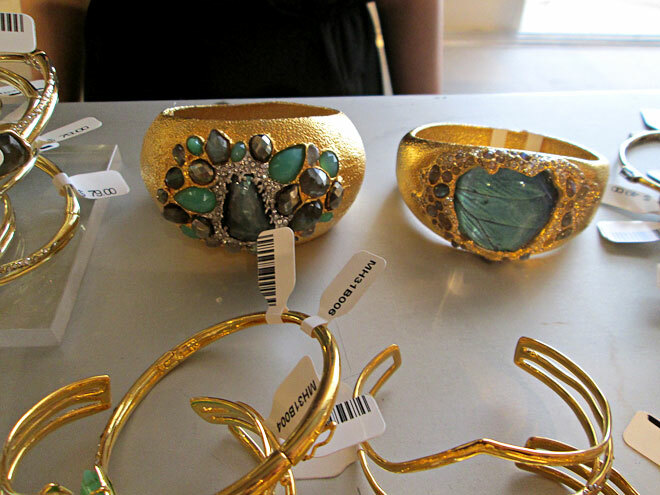 SO many of these pieces were enticing with their color palette, pink and yellow gold, rose gold, turquoise and yellow gold, and plenty of dark and stormy looking stones too. 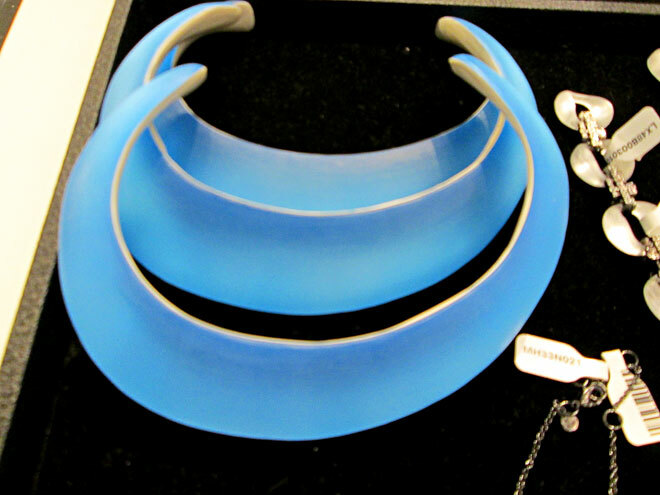 A beautiful sculpted lucite collar was just $49. Rings were also to die for, and we think that Alexis Bittar’s price range satisfies in between the range of cheap costume throwaways, and fine jewelry that is inaccessible to most or basic at best. 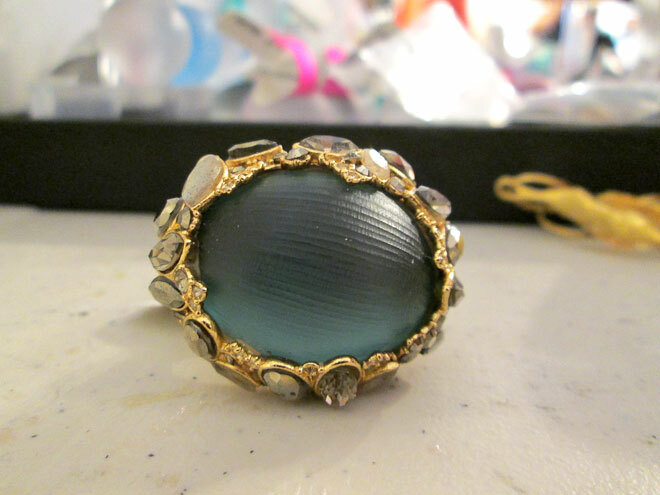 Why go to some dinky jewelry shop to see all the same stuff when you could get a large stone in a gold dipped setting for around $200? Sure, they aren’t diamonds, but you aren’t the Queen of England. Big, baloonish lucite rings hung out right next to the Yurman-esque most popular styles of cocktail ring. It was a lovely selection and we think you will agree. Earrings and bracelets were also in no shortage, and if you need a thin bangle or a thick arm cover, there are both and everything in between. It’s truly distracting to see so much shiny stuff in one room. Chandelier earrings galore were a huge standout. Who doesn’t want to channel a pompous royal with such stylish selection. There was every color one could hope for, and some small and dainty versions as well, so even if you only want to have one pair of statement earrings, you may fall in love with more than one pair here.